Buckeyes Take The ‘Black And Blue’ Show On The Road…. Their numbers are alarming, and disarming – downright ‘offensive’. Now, they’ll see how their thunder and lightning plays when the Buckeyes take it on the road this week…to Iowa. Columbus – Veteran major league baseball analyst Tim Kurkjian is fond of using the term, “the numbers don’t lie.” And, he’s onto something. Because in the age of saber metrics the numbers (statistics) tell you more about why baseball teams win and lose than ever before. And they do it to almost an annoying degree. Never in the history of baseball has their been so much information – “WAR”, “WHIP”, “OBP”, “OPS” – it goes on and on. There’s so much calculated and written about baseball that you can’t read and digest it all, and Kurkjian readily admits as much. But where the 2018 Ohio State Buckeyes are concerned after 27 games, there’s really only one stat you need to know. “WAR” (wins over replacement), “WHIP” (walks plus hits per innings pitched) and “OPS” (on base plus slugging) is secondary to the sheer fact of – wait for it – team batting average. That is, how often do you get a base hit relative to the number of at bats? The gold standard, since the game’s inception, has always been a .300 average. 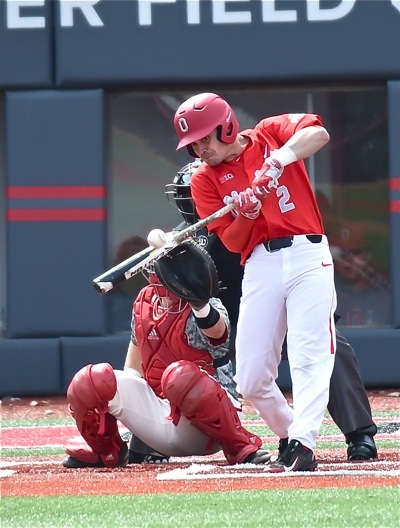 If you’re hitting .300 you’re pounding the baseball; and the Buckeyes are front and center in the Big Ten this week with a team average of .309, and just outside the top ten, nationally (Florida Gulf Coast University ranks 10th with a .313 average). They certainly padded those numbers in last weekend’s series with Nebraska. Winning 15-14 in Sunday’s rubber game (they won 2 of 3), the Bucks lashed out 22 hits, scored 15 runs, and had four players (Kobie Foppe, Tyler Cowles, Dom Canzone, and Conner Pohl) with three or more hits in the game. Noah McGowan went a paltry 2 for 5, but that included his sixth home run of the year in the seventh inning. Their ‘thunder and lightning’ breakout elevated them to the Big Ten’s top spot in batting average (.309), on base percentage (.399), runs scored (212), hits (297) and RBIs (196). Individually, Canzone leads the conference in hits (45), and McGowan is slugging (extra base hits) at a .710 clip! All of this is good – head-swimming good. 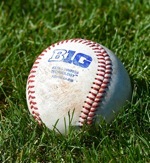 Phoenix Bats, an Ohio company, is proud to support Big Ten Conference baseball on Press Pros Magazine.com. But there’s actually another stat you need to know, and that concerns pitching. Because all the runs in the world can’t help you if you can’t limit the other team from scoring more than you. And to our constant premise since before the season began – that if the pitching can hold teams to less than five runs…they’ll score more than five – those numbers become more and more in focus with each passing game. No light-hitting shortstop…transfer junior Kobie Foppe has joined the hit parade with a .333 average. Friday starter Connor Curlis has been as good as anyone could ask. He’s 4-1, with a 3.12 ERA, and opposing teams are hitting just .224 against him in 41 innings. 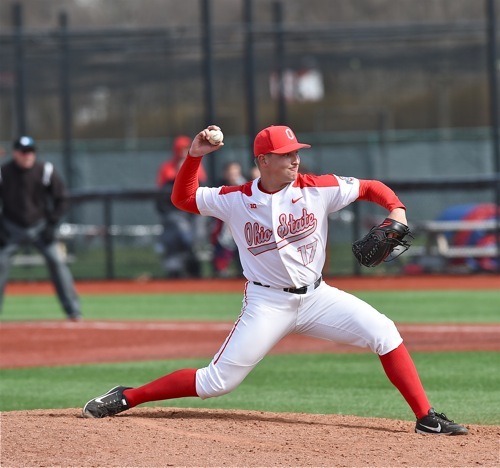 Ryan Feltner has pitched second in the weekend rotation and owns a 3-1 mark, but with a 5.18 ERA, and opposing teams have 43 hits against him in 40 innings…a .274 average. Adam Niemeyer, co-captain and the Sunday starter has a 2-2 record, with an ERA of 5.85. He’s given up 44 hits in 32 innings, and teams are hitting .321 against him. 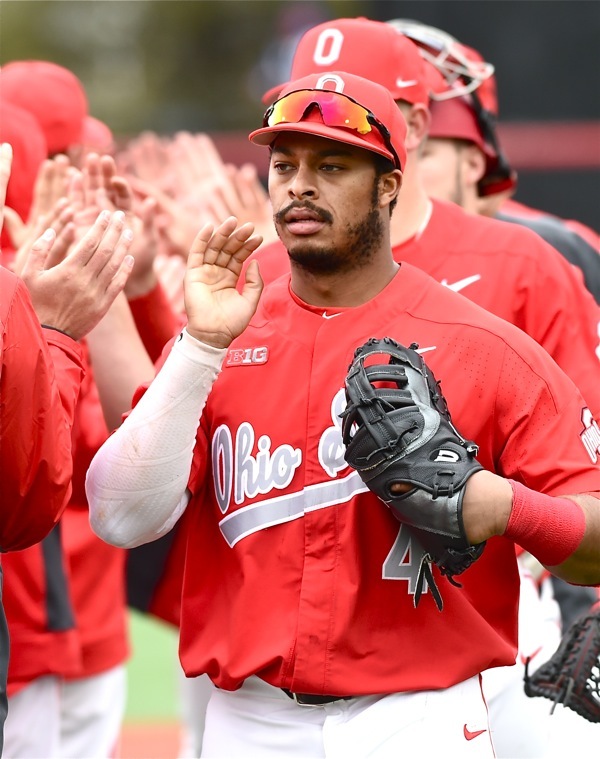 So the starting pitching, collectively, has been right at a 5.00 (4.71), and as a team they’re throwing at a 4.12 average (the bullpen has been a run and a half better per nine innings), while opposing teams are getting bludgeoned by the Buckeyes batting order – a 7.12 earned run average. Hey, you can win A LOT of games that way! It’s “black and blue” baseball, as coach Greg Beals likes to characterize Big Ten competition – survival of the fittest – and now for the next two weeks the Buckeyes will literally see black and blue baseball when they travel to Iowa this week (16-9, overall…they wear black and gold), and Penn State (7-15, currently…and they wear blue and white). Iowa is another team of thumpers, the reigning Big Ten champs…a team hitting .275 collectively (7th in the conference) after beating #22-ranked Illinois two out of three last weekend, in Illinois. And where Ohio State ranks 5th in conference pitching with their 4.12 team ERA, Iowa ranks one notch below them (sixth), pitching at 4.25. So the two teams, at least on paper, are very evenly matched. But Kurkjian also points out that numbers highlight one’s deficiencies, as well; and the one stat where OSU and Iowa are not evenly matched is with their ability to catch and throw the baseball. Closer Seth Kinker has been ‘nails’ out of the ‘pen, with a team-leading 1.82 ERA, 4 wins, and 6 saves in 24.2 innings. 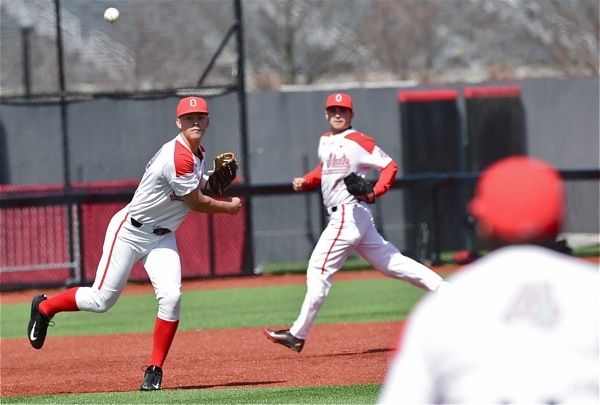 Ohio State actually ranks last in the conference defensively, through 27 games, with a .955 fielding percentage. They have 46 errors in 27 games, 16 more than opponents. Iowa, compared, is much higher with a .971 percentage, fifth in the Big Ten. They have 27 errors in 25 games. It is what it is, as one player said last weekend, but it’s been their one and only achilles heel. They’re aware, and Beals and his staff consider their options daily. But bottom line…how many options do you really have when you’re leading the league in hitting and runs scored; and when those three errors per game aren’t costing you ballgames? At least, not yet! By the way, if you’re a dyed-in-the wool fan for Buckeye baseball Iowa is a pretty good trip – about eight hours if you want to go. Games have been rescheduled for Saturday, Sunday, and Monday afternoon…and the weather is forecast to be miserable – in the 40s with intermittent rain and snow. More black and blue baseball! But this weekend, away from the comforts (and the heaters) of Bill Davis Stadium, is going to be revealing…and a test of time-honored baseball cliches’. Thank you, Tim Kurkjian. Does good pitching beat good hitting, when the pitching is that evenly matched? Can the Buckeyes leave some black and blue welts on Hawkeye pitching? Kurkjian says that games between evenly-matched teams usually come down to how well they catch it, and throw it – their ability to make plays. So Tim, will the numbers lie? The simple act of catching and throwing the ball has been the Buckeyes’ one hiccup. They lead the Big Ten in errors.